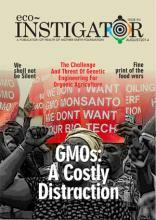 Why is NAS a stakeholder in GMO? Are they not supposed to be an independent organisation responsible for helping the advancement of science and technology? Does their stakeholder position not introduce some sort of bias favouring GMOs already? It is so disappointing that Nigerian scientists are taking a stand on a technology they have not even tested. The dependency on the West for us to make national decisions is ridiculous especially on a controversial technology that has been banned in 6 out of 8 countries that make up the G8. This is not a fact. None of these organisations have ever tested GMOs. In fact, the FDA depends on the organisations that produce GMOs to test their safety. Till date, there have been no human trials on the short term or long term effect of GMOs in humans. The only investigation that was carried out was by the International Agency for Research on Cancer (IARC) – WHO’s cancer agency – which concluded that glyphosate (a herbicide used alongside GMOs) was carcinogenic to humans. It is so disappointing that Nigerian scientists are taking a stand on a technology they have not even tested. The dependency on the West for us to make national decisions is ridiculous especially on a controversial technology that has been banned in 6 out of 8 countries that make up the G8. There are many studies that have highlighted the health and environmental effects of GMOs and so with those studies in scientific journals, I am more than curious to know how NAS came up with their conclusion. Nigerians need transparency and accountability, especially when it concerns food, an item that every Nigerian ingests daily. Despite the most recent investigative report published on the 29/10/16 by the New York times titled “Uncertain Harvest: Doubts About the Promised Bounty of Genetically Modified Crops” concludes that, genetic modification in the United States and Canada has not accelerated increases in crop yields or led to an overall reduction in the use of chemical pesticides. The analysis by The Times using United Nations data showed that the United States and Canada have gained no discernible advantage in yields — food per acre — when measured against Western Europe, a region with comparably modernised agricultural producers like France and Germany. It is also very worrying that these scientist did not address the impact on the environment and human life that comes with higher use of herbicides and pesticides neither did they explain the technology’s failure to meet its promises of increased yield but instead delivered weed and pest resistance. All of which have been well documented in scientific Journals. This is extremely worrying and calls in to question the extent of their literature review. Below are some studies I hope (NAS) would look into. A Scotland Rowett Research Institute researcher and world’s leading lectins and plant genetic modification expert, Arpad Pusztai conducted the first ever independent experiment. Rats fed GM potatoes had smaller livers, hearts, testicles and brains, damaged immune systems, and showed structural changes in their white blood cells making them more vulnerable to infection and disease compared to other rats fed non-GMO potatoes. It got worse. Thymus and spleen damage showed up; enlarged tissues, including the pancreas and intestines; and there were cases of liver atrophy as well as significant proliferation of stomach and intestines cells that could be a sign of greater future risk of cancer. Equally alarming, results showed up after 10 days of testing, and they persisted after 110 days that’s the human equivalent of 10 years. Inserted genes in genetic modified food can move into gut bacteria or internal organs, causing these organs to potentially become cancerous. If GM corn genes with Bt-toxin gets into gut bacteria, our intestinal flora may become pesticide factories. This can contribute to antibiotic resistance we already see around the world. The few scientific research done on these foods have showed stunted growth, impaired immune systems, bleeding stomachs, abnormal and potentially precancerous cell growth in the intestines, impaired blood cell development, misshaped cell structures in the liver, pancreas and testicles,Infertility, altered gene expression and cell metabolism, liver and kidney lesions leading to failure of the organs, partially atrophied livers, inflamed kidneys, less developed organs, reduced digestive enzymes, higher blood sugar, inflamed lung tissue, increased death rates and higher offspring mortality as well. All these studies were done in Rats and Mice. Nigeria’s health system currently lacks the capacity in terms of technology and infrastructure to deal with not just infectious diseases but cancers and other terminal diseases; shouldn’t we be preventing more diseases? If Nigeria wants to grow GMO, then scientists need to follow due process. They should set up a world standard laboratory with scientists who have the skills to test GMOs. They should do their own independent study and publish it for Nigerians to read. Making national decisions for 180 million Nigerians because America says so would not suffice. Also, if the foods are introduced, they will not be labelled as Nigeria does not have a system of identifying and labelling foods or allergens. This automatically takes away the choice of people who do not want to eat GMOs as there would be no way for them to identify GMO-free food. NABDA and NABMA which are supposed to be regulatory organisations are also GMO stakeholders who do no testing and the Ministry of health says it’s relying on these organisations to test GMOs. So one question remains, in whose interest is the introduction of GMO to the country for? These organisations need to be questioned and held accountable by all Nigerians because food is the very thing that links us all and if our food isn’t safe, we have a right to know. Prevention is better than curing diseases. Not everyone can afford healthcare abroad. *Ify Aniebo (BSc, MSc, MRes, MPH) is a molecular geneticist from Oxford University, with a master’s in public health completing her PhD on the genomic determinant of Malaria infection. She most recently was honoured by the mayor of London for her innovation in malaria diagnostics. She was awarded the prestigious Young Person of the Year Award and the Best Use of Science Award by the future awards Africa. A bill gates scholar, she has worked at the top Genetic research institutions such as Illumina and the Sanger Institute. She was recognised in a ceremony by the British House of Commons and was also recognized by Nigeria’s President Goodluck Jonathan during the centenary celebrations as an inventor and innovator.